My city after round 2. I found a place for those duplex tiles, but it wasn't easy. You are a city planner hired to collaborate simultaneously on two cities. You want to arrange the cities perfectly so there is enough diversity that people want to live there, but also enough commerce and industry that the city is profitable. You want the people to be happy. But most of all, you want the slim notoriety offered to city planners. After all, while you are working with partners, you want your name to come first in any documentation released from city hall. Can you work effectively with others while also advancing your own interests? Find out in Between Two Cities! Between Two Cities is a tile-drafting/city-building game for three to seven players (playable with one or two players with variants). Each player works with the player on the right and the player on the left to craft two cities that are a perfect 4×4 grid. At the end of the game, the player whose lower-scoring city is highest on the scoretrack wins. To begin the game, players decide seating order. 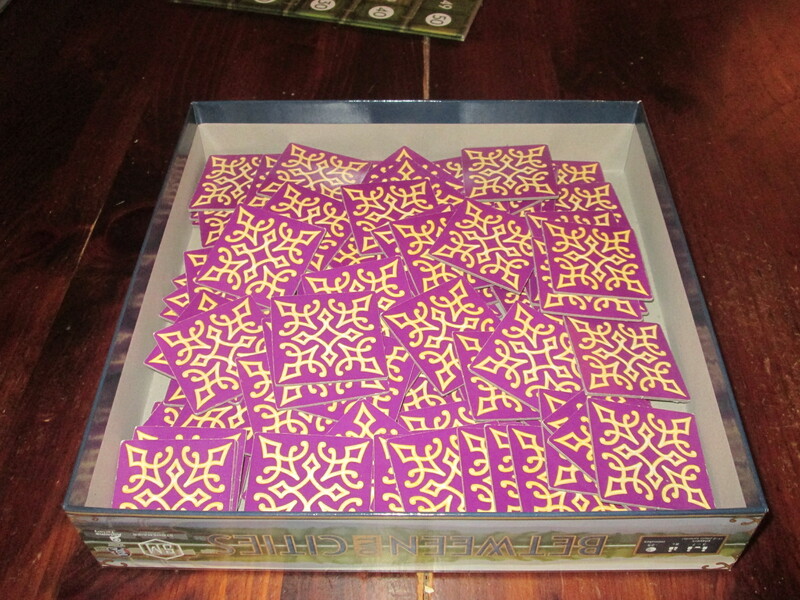 Each player draws seven city tiles, and a city token is placed in between each player seat to mark the cities in the game. A matching token for each city is placed near the scoreboard. Between Two Cities set up for four players. 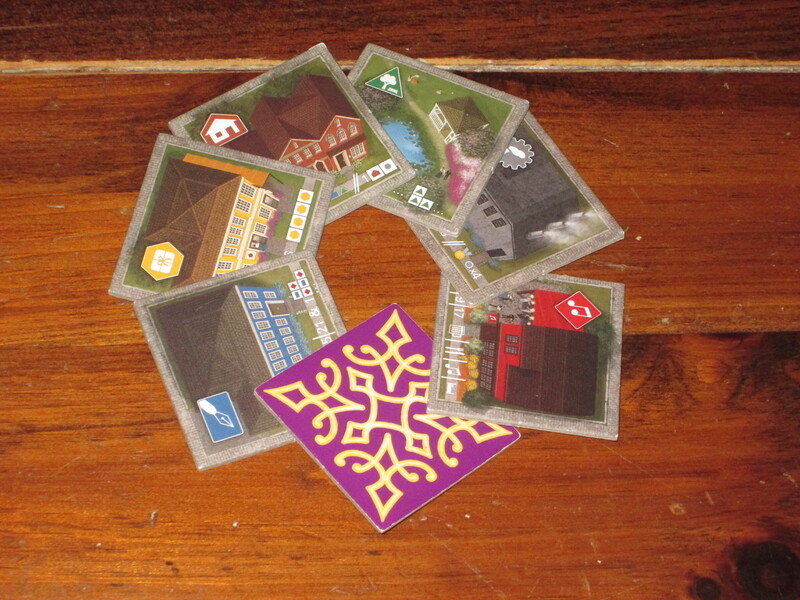 In the first and third round, players will choose two tiles from their hand, passing the remaining tiles to the next player (to the left in the first round, to the right in the third round). Tiles represent different buildings in the city, each of which scores differently: shops, factories, taverns, offices, parks, and houses. Once all players have chosen tiles, they reveal them. Each player must place one chosen tile in the city to their left and one tile in the city to their right. 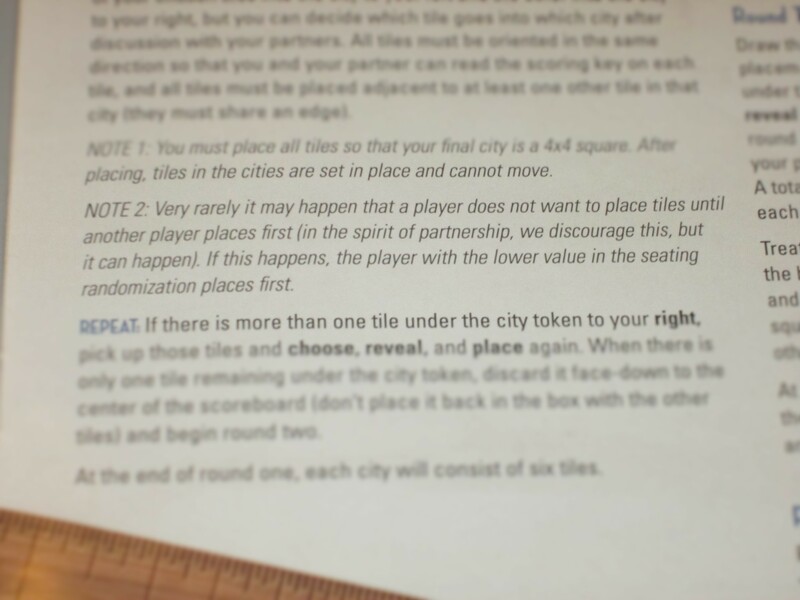 Players can discuss with their partners to determine which tile goes where. 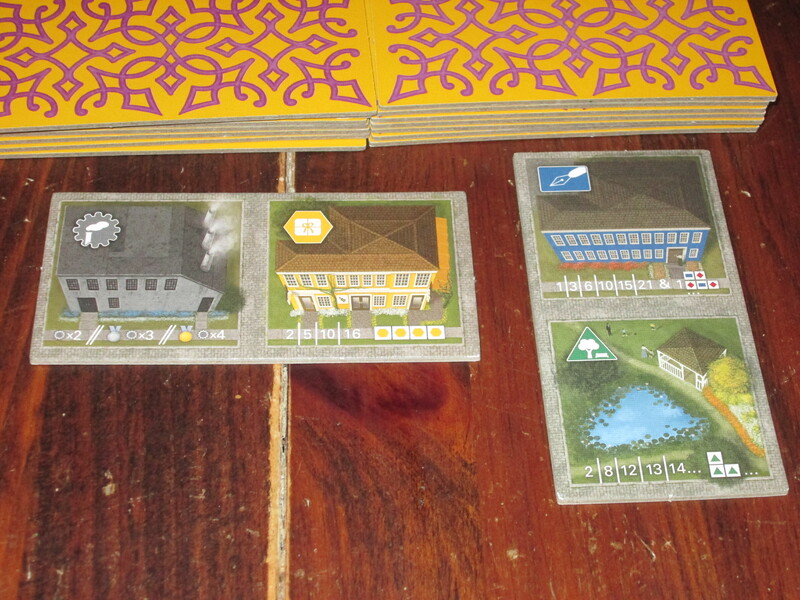 In the second round, players receive two duplex tiles of two buildings each. They choose two and discard the third, assigning one to the city on their left and the other to the city on their right. Between Two Cities comes with a player aid for each player. The aid is a great reminder for the scoring conditions. Once the third round is completed, players score their cities on the included scoreboard. The player whose lower-scoring city is higher than the other players’ lower-scoring cities wins the game. If there is a tie, the tied players compare their higher-scoring city, and the player with the higher-scoring city wins. Note: These are the rules for the three to seven player game. Between Two Cities includes components and separate rules for a solitaire game and a variant for a two-player game. Constructing Constantinople, or Razing Rome? I would imagine that designing a drafting game is difficult these days, at least if you want to get noticed. 7 Wonders brought drafting from the back room of the game store to Mom’s dining room table, and after its Kennerspiel des Jahres win, it remains a gaming staple. Do we really need another drafting game? I keep being surprised that the answer to this question is yes. And in the case of Between Two Cities, the answer is a resounding absolutely. There are six different building tiles in Between Two Cities, each of which scores a little differently. Between Two Cities has several characteristics that are familiar, but it also has some clever novelties that make it distinct. First, the familiar. There are six different tiles in the game, and each one has a different scoring condition. 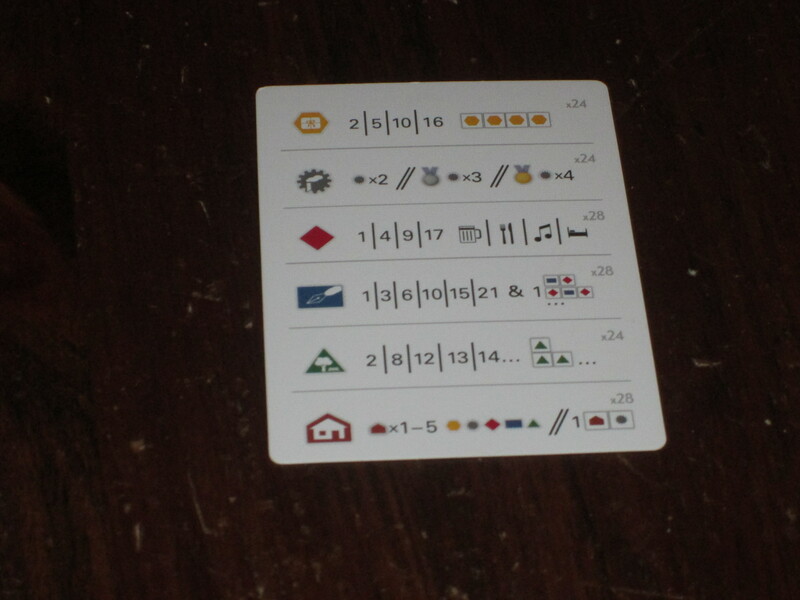 However, unlike more complex games (like 7 Wonders), there aren’t a lot of symbols to learn. Every factory tile behaves like every other factory tile, every shop is a shop, and so on. So there is very little rules complexity, even though there are six distinct scoring opportunities. 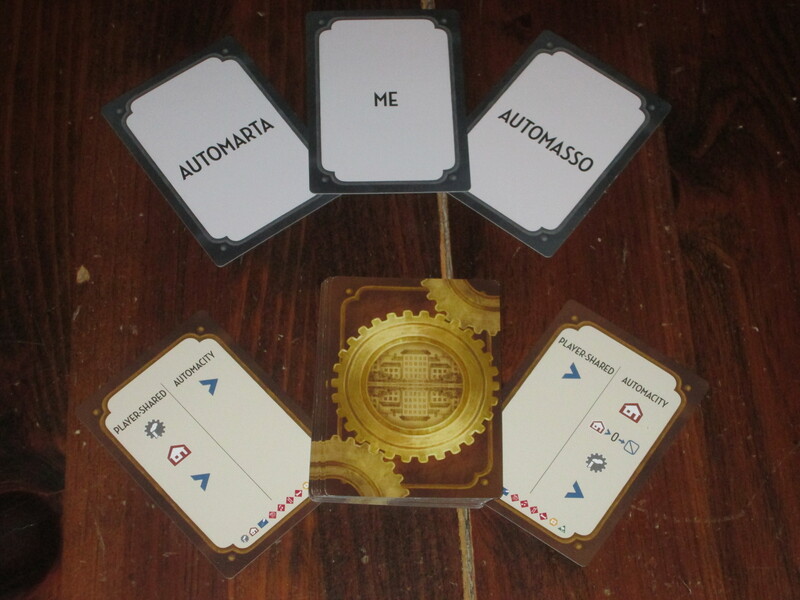 Players choose tiles from an individual hand that will be passed on to the next player. This is also familiar, although here there is the twist that the person you’ll be passing tiles to is working with you. Sort of. See? It even says it in the rules: this game is meant to be collaborative. Between Two Cities has a very different feel from other drafting games. Namely, there is a spirit of collaboration here that is absent from more competitive games. Between Two Cities is not cooperative in that players don’t win together. They only want to help their partners insofar as it helps themselves, but helping themselves is a powerful motivator in the game. We’ve seen the “highest-lowest” scoring system before in games like Tigris & Euphrates and Ingenious, but it works especially well here to keep players from working on one amazing city and consigning the other to the slums. Because players are scored by their lowest-scoring city, they have an incentive to work equally for the prosperity of both cities. Making one city that scores tons of points isn’t as helpful as making two modest cities. Because of this, scores in the game are often tight, usually within ten points of each other from top to bottom. Some players might see this as a sign that player decisions don’t matter. I see it as bearing forward the game’s collaborative charm. Even the players in last place usually don’t feel like they’ve failed; rather, they feel spurred on to try again. 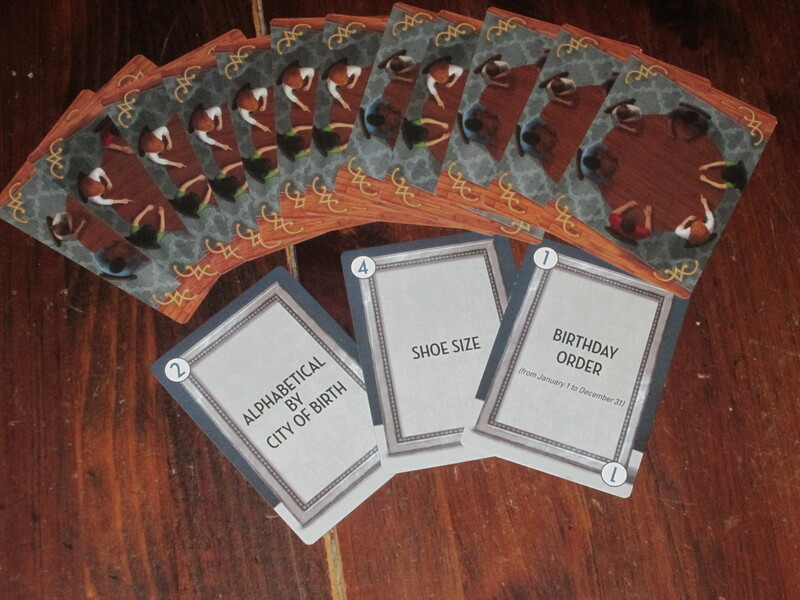 Between Two Cities comes with cards to help the players determine seating order. This is a great idea and acts as kind of an icebreaker. Some of these ideas are better than others, but kudos to the publisher for including them. By encouraging collaboration, Between Two Cities encourages discussion, which also allows for the spontaneous banter that elevates board gaming above some more solitary hobbies. 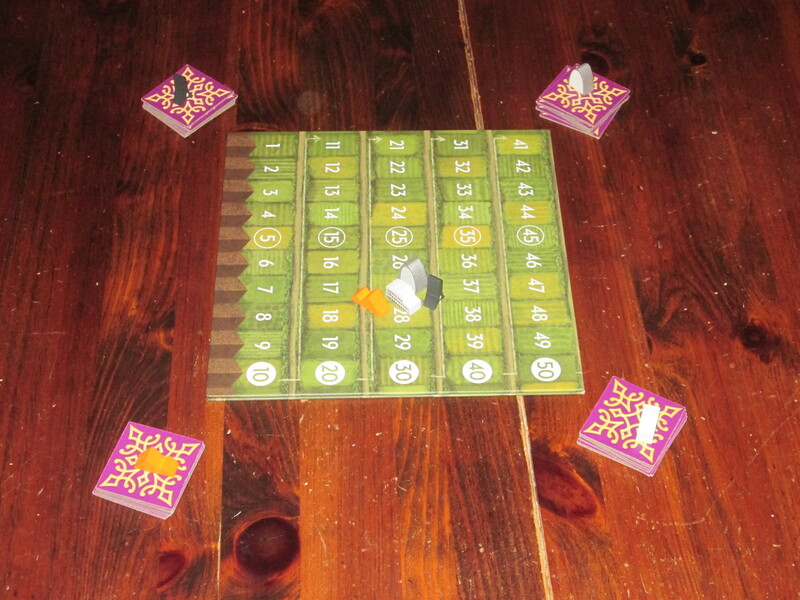 The game is easygoing, so it allows players space to do things other than simply focusing on the rules. 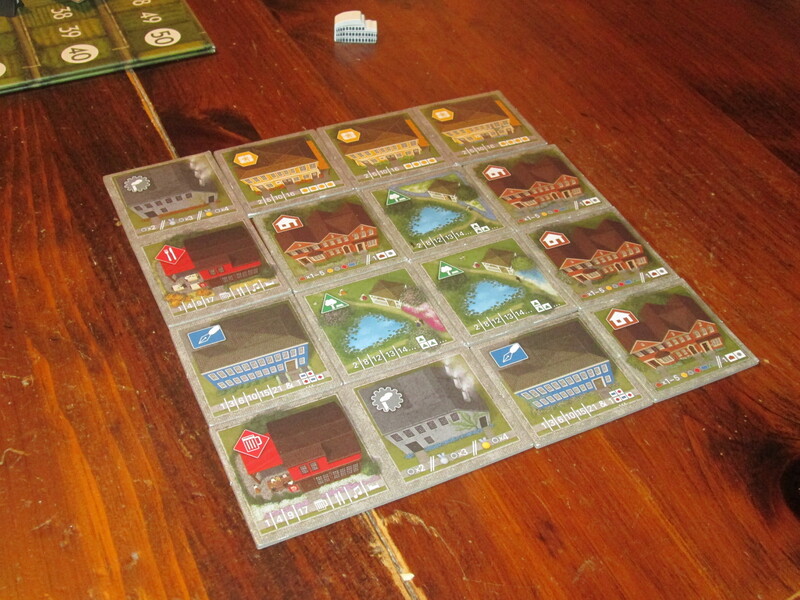 In one game, my brother-in-law and I were building a city full of factories, foregoing many other tile types. My wife looked over and called it Pottersville, which made me laugh, and we tried to include the rest of the table in the joke. They looked at us quizzically, and through this exchange we learned that the other members of my family do not like the movie It’s a Wonderful Life. (I still found ways to finish the game and love and accept them as family despite this obvious shortcoming.) What I’m getting at with this is that the game offers plenty of opportunities to find things out about the others at the table. The seating order cards that come with the game further prove this and are a nice addition, almost serving as a pregame icebreaker. My city after round 2. I found a place for those duplex tiles, but it wasn’t easy. Between Two Cities is novel in that it is collaborative; its spatial nature is another source of novelty. Where players place their tiles matters for scoring. This has been done before in a drafting game (Among the Stars), but again, here the concept is simplified: rather than having a special power on each tile, which requires a longer rules explanation and more puzzled expressions, tiles always interact with other tiles in the same way here. Houses are always worth fewer points adjacent to factories, offices are always worth more when they’re by somewhere to go on breaks, and parks are worth more when they’re large enough to allow people to enjoy nature (but not so large as to eat up valuable real estate in the city). Not only are the adjacency rules simple; they make sense within the thematic story of the game, which makes remembering the rules much simpler. In this way I’ve found the thematic notes in the rules helpful and always mention them while teaching. The city tokens. 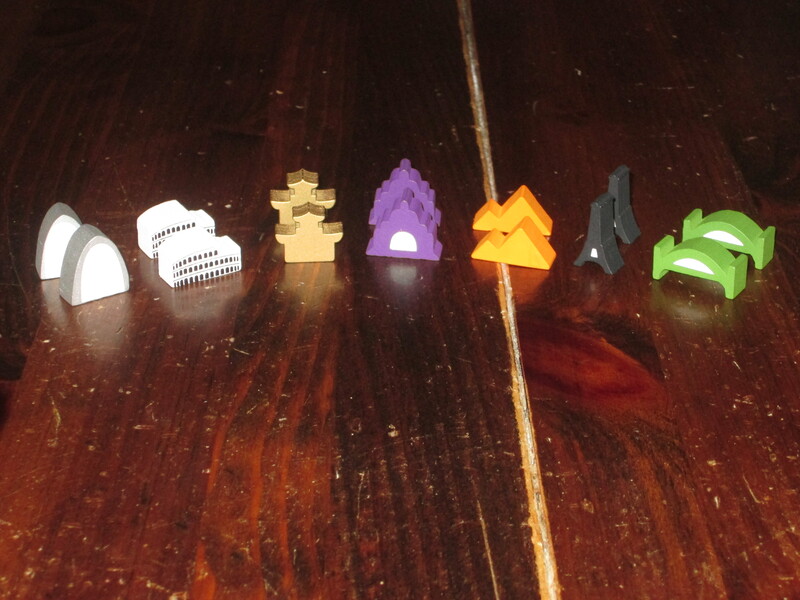 The custom shapes are above and beyond, although the Taj Mahal (purple) is a little baffling to my eye. The spatial puzzle is more interesting than just adjacency rules, though. Because the finished city has to be a 4×4 grid, players must visualize the final blueprint of the city they want while also dealing with the reality that the tiles they want might not come their way–or might not come their way in the order they need them. A tile laid is a tile played, so players have to constantly adapt their plans to the draft, and what the players thought would be the eastern edge of the city might become the city center as the game progresses. 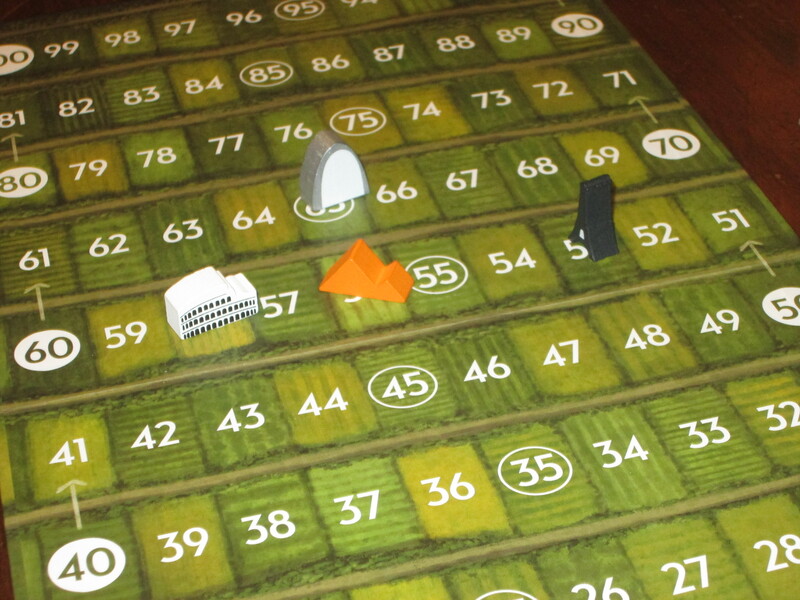 One of the interesting bits of Gold Ahoy was the shifting landscape as the final board had to be a prescribed size. You get the same feeling in Between Two Cities, but the underlying mechanics of the game are much more interesting to me. You also have to contend with the draft in that, while you may have in mind where you want your tiles to go, this can change based on what your neighbors choose. There have been many times where I’ve had to adjust my strategy based on the collaboration because there was no room for a factory in one city save by a house. The duplex tiles. These introduce the coolest novelty to the game. These are such a fascinating idea. They break up the regular flow of the game and really are game-changing. Between Two Cities takes full advantage of the spatial puzzle by introducing another very cool novelty: duplex tiles. Duplex tiles are an exercise in making do. Each game two of these tiles will be added to each city, and the inevitable question I get each game is “What if a duplex tile doesn’t fit?” My answer is always “It’s impossible for them not to fit–you just might not like where you place them.” The reason for this is that each duplex tile has either a horizontal or a vertical orientation that cannot be changed. While this is occasionally frustrating when you aren’t given a choice, it is always fascinating. The duplex tiles also stretch the collaborative spirit of the game as each player weighs the trade-offs for assigning a tile to the city. You’ll rarely get everything you want–right tiles, right order, right orientation–so you have to decide what you will forgo and what will provide the greatest good for the city. This is a judgment call, and there is obviously room for disagreement among partners. The scoreboard. In this game, the player who sat between the Colosseum city and the Gateway Arch city won because he had the highest lowest city (Colosseum). For a game that advertises play with up to seven players, there is remarkably little variation in game time in small games or large ones. Once players know what they’re doing, a full game can be played in 15-20 minutes. The first time I played the game, I taught the rules to seven fresh players over a lunch break, and we were able to learn the rules, setup, and tear down twice all comfortably within an hour. I think this is one of the game’s greatest strengths: it’s quite versatile while still being an interesting enough game that I want to play it. There aren’t many other games I can say this about. Even 7 Wonders has its detractors. One of them was in this initial lunch group, and while he blackballs 7 Wonders every time, he quite enjoyed the collaborative spatial puzzle that Between Two Cities offers. I’m thrilled to have a game like this that seems to be the right key for many, if not most, locks. At least when it comes to quick games. I don’t think everyone will love Between Two Cities because the tile varieties are always the same and luck of the draw can definitely hamper your progress. 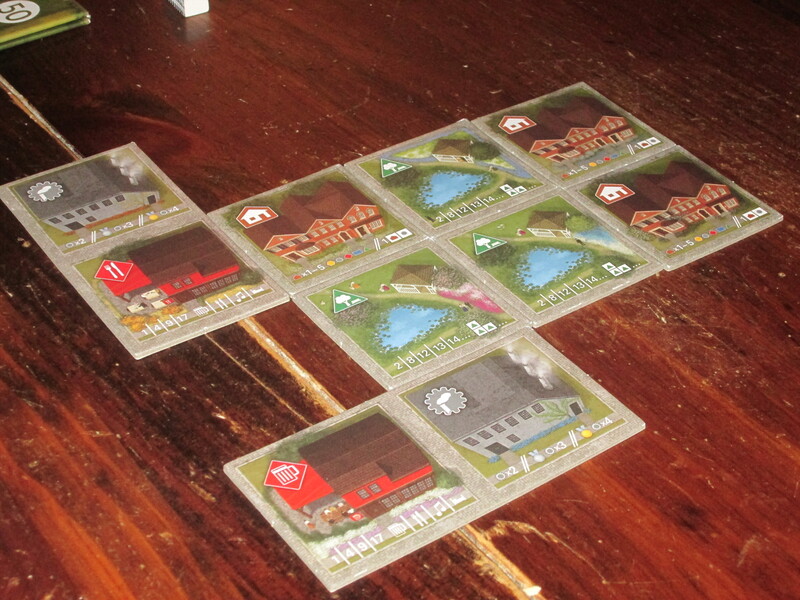 And while it is simpler than 7 Wonders, it also lacks comparative depth. I also think the game is more interesting on the higher end of the player count, but it’s still fun at lower numbers. I don’t view these as deal breakers, especially in a game as quick as this. The components in Between Two Cities are excellent, for the most part. The tiles are sturdy, as is the game board, and I like that a solitaire game and seating-order cards are included. I’ve heard some complain that the art is drab, but I like it. It’s appealing to look at the city you’ve built at the end of the game, and the art doesn’t distract while you’re playing. The iconography is well-conceived, and the scoring aids are a welcome inclusion for teaching purposes. The city tokens are nice, although my group had trouble making out what some of them were supposed to represent. (The Taj Mahal token particularly baffled us.) The scoreboard is nice, and I like that it’s double-sided (a snaking score path and a resetting “typewriter” board), but for my part, I would have preferred a scorepad, even though I understand that it makes better publishing sense to include a board. I also wish the game had included a tile draw bag, as it’s a bit annoying to turn tiles face-down in the box before the game begins. Some tiles have begun to show wear and peel, but the vast majority of them are still perfectly intact after nearly twenty plays, and there are only six varieties, so having “marked” tiles isn’t a big deal. All told, this is an excellent package, well worth the price. Cards for a solitaire game come standard with the game. The solitaire game is a lot of fun to play and difficult to win. 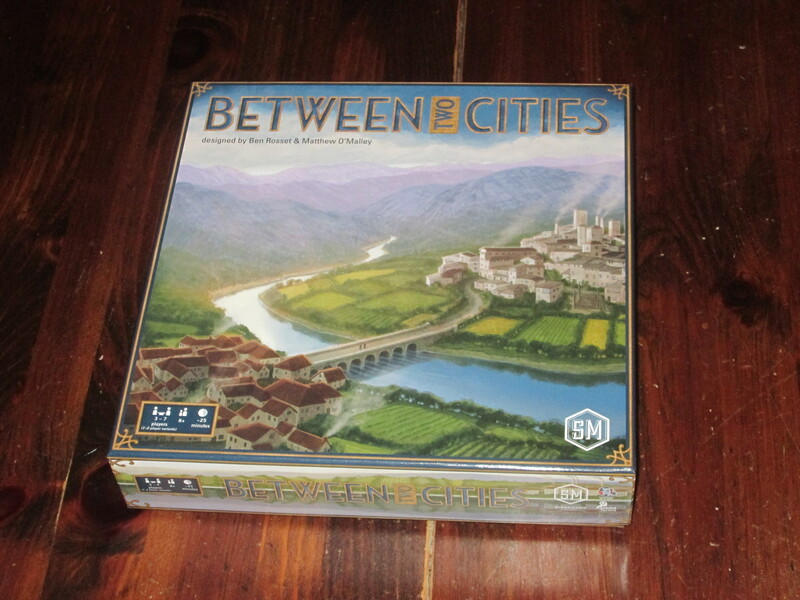 Between Two Cities includes a solitaire game and a two-player variant in the package. I’ve not played the two-player game, but I’ve played the solitaire game several times. It is superb. The rules overhead and setup are simple, but the puzzle the game provides is very satisfying, especially because the automated players have the advantage of always receiving full points for their builds. It’s hard to beat the robot opponents. (I play the automated players on an even field, with no handicap in either direction, but you can subtract points from either score to make it easier/harder as you see fit.) Between Two Cities requires more space than small-package solitaire games like Friday or Onirim, but not as much space as, say, Robinson Crusoe or Mousquetaires du Roy. I planned to just try a few rounds of the solitaire game for the purposes of this review, but I found I kept coming back to it to try it again (and still enjoy it). My final city. It’s satisfying to survey your work at the end of the game. And that has been the consistent response to Between Two Cities. It’s simple to learn and quick to play and it has the addictive quality of a Spiel des Jahres contender. The gameplay is collaborative and succeeds in opening the table to discussion. I don’t think this game is as strategically compelling as 7 Wonders, but it is also much less complex, and it introduces some clever novelties of its own. There’s definitely a spot for this one in my collection. Between Two Cities is a hit–with my family, with my friends, and with me. iSlaytheDragon would like to think Stonemaier Games for providing us with a review copy of Between Two Cities.